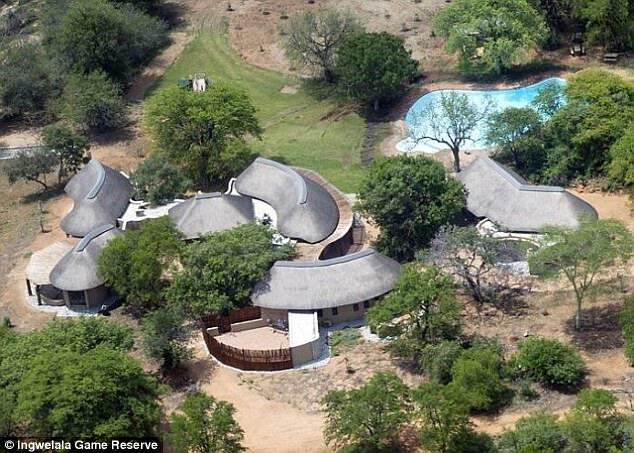 Police at first thought the dead man was a tractor driver who worked at the game reserve. But when he turned up alive, they realised he may have been a poacher. A hunting rifle was found close to what was left of the blood drenched body. Police in Limpopo have called in the Department of Home Affairs to help them to try to identify the dead man, who was not carrying documents. Police Lieutenant-Colonel Moatshe Ngoepe said: 'The process of identifying this body has already commenced and it might be made easier as his head was amongst the remains found at the scene'. The owner of the reserve, who identified himself as Josh, said he was told not to speak to the media because the police investigation was still under way. A local worker, from a nearby nature reserve, described the area as lion territory and added: 'The head was still there but the lions had eaten most of the rest. 'A scream was heard and the lions were scattered by the sound of gunshots but it was too late to do anything for him. He was eaten'. Mr Ngoepe confirmed police were investigating the possibility the deceased might have been a poacher after a hunting rifle was found near the scene. Lions kill up to 250 people a year in Africa and a male weighs 190kg and a female 130kg and they can ran at over 80kph and there are less than 20000 left in the wild in Africa. Their bones have become highly prized in the the Far East with a skeleton fetching up to £7,000 and the skin £3,000. Teeth can fetch £500 each. British wildlife photographer Charlie Lynham, 59, from Liverpool who now lives close to the reserve has spent years photographing the resident lion pride that lives there. He arrived at the gates shortly after the alarm was raised and the paramedics had raced in. 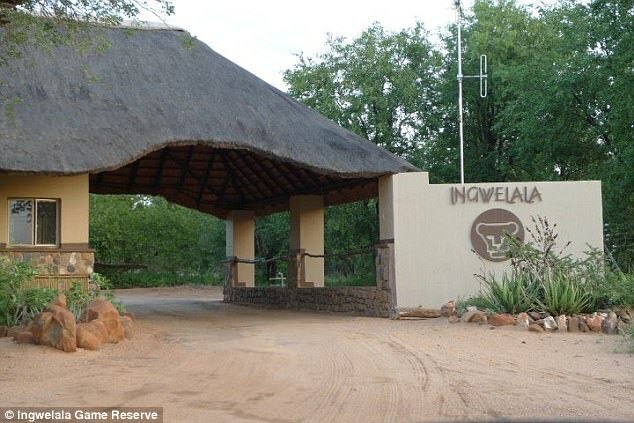 Mr Lynham was told that the suspected poacher had been killed - but he added that it was not yet clear whether the attack had happened inside Ingwelala or in a neighbouring reserve. 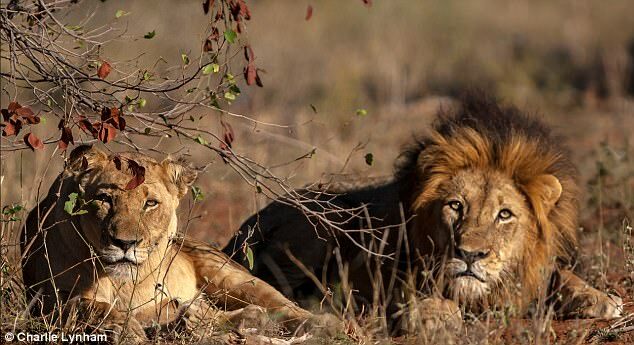 'It turns out it was not the resident pride that lives here responsible as they were on a buffalo kill at the time of the incident but a pride perhaps come over from the Kruger (National Park),'he said. 'It happened on the border of the Umbabat Game Reserve after dark and may have been on their reserve. 'Two .456 big game rifles and ammunition were found at the scene and that is the weapon of choice used by those hunting big game - especially elephant and rhino in the bush. 'Lions are not a particular danger in daylight but after dark, then that is another matter. 'It is purely speculation on my part but it would seem they either walked into a pride of lions in the darkness or they were stalked and attacked and a man was taken down and eaten. 'The other two it seems ran off and two .456 big game rifles were found and ammunition. 'But it was not our pride and was probably one from the Kruger that come over the border,' he said. The incident comes just months after poacher Luteni Muhararukua was charged and killed by a rhino he was hunting for its horn in nearby Namibia. One for the Lions - GOOD!!!!! Good for the lions! It's about time the animals turn the tables. He man came in with a rifle, into a place where the animals were being protected, and he intended to SLAUGHTER them for no reason. Likely vomited up this sorry human-ape.